It tastes like nothing. I don’t need to eat a pink blob to get hydrated, I can drink a glass of water… it has just as much flavor. I love fruit. Love. And it’s not that I won’t eat watermelon… it’s just absolute bottom of the barrel in the fruit world. 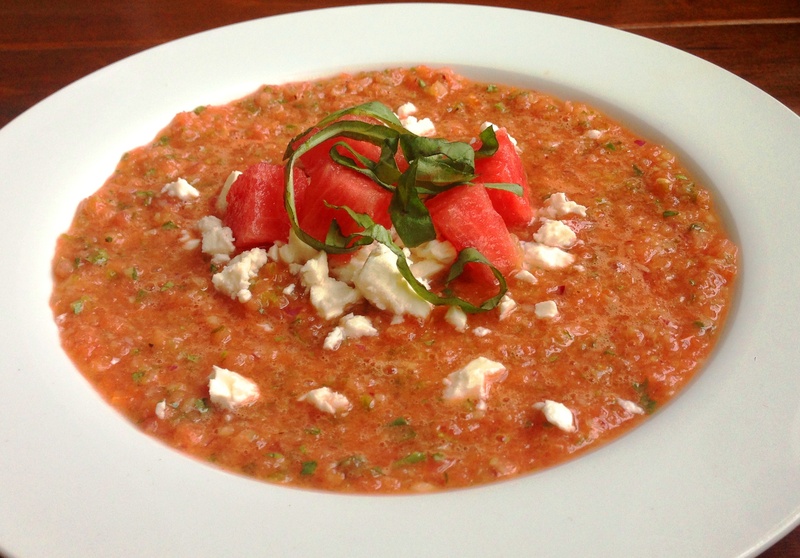 This gazpacho doesn’t taste watermelon-y. It tastes spicy, acidic, sour and just the tiniest bit sweet. 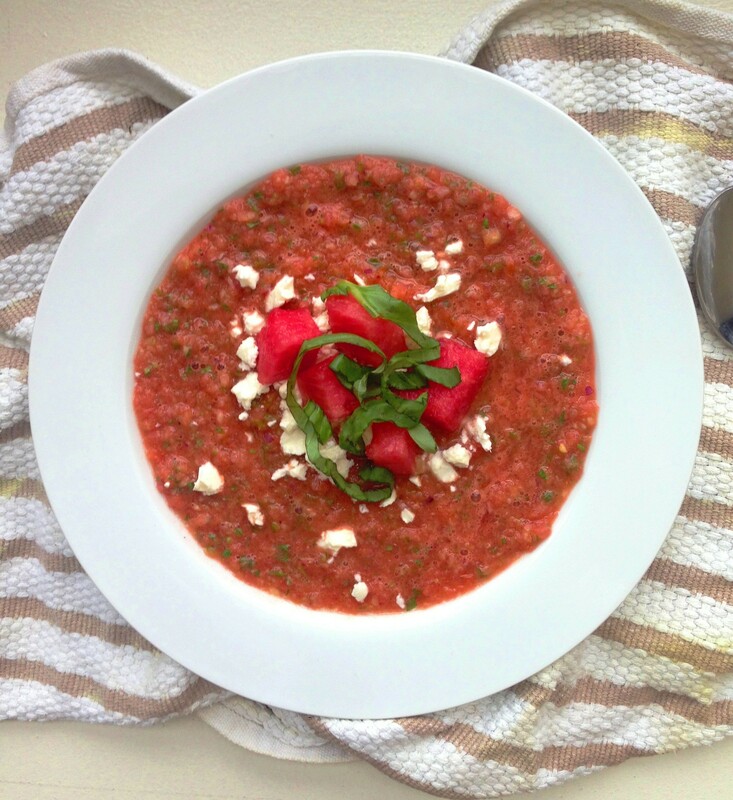 The watermelon gives it a summery clean, bright and fresh flavor. What a lovely way for me to sneak some watermelon into my bod without having to eat weird textured, seed-filled, watermelon chunks. Win. Roughly chop the tomato, cucumber, and red onion. Carefully chop the chile, I take no responsibility for any eye burns you have. 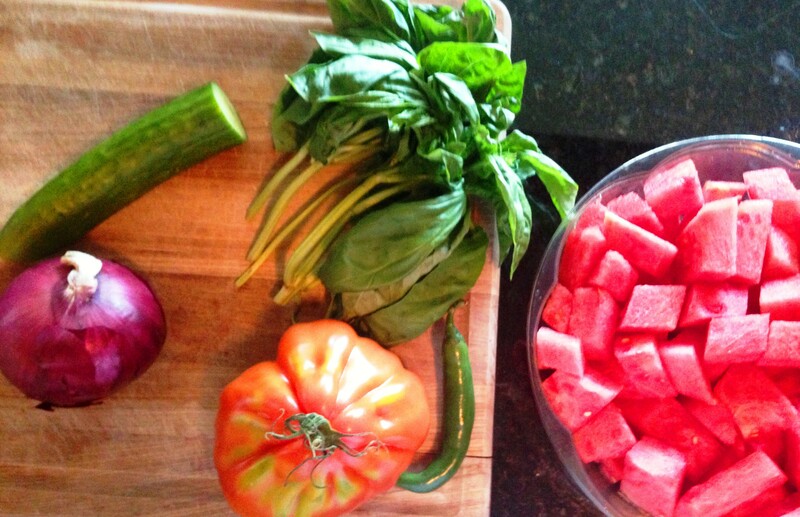 Pulse the tomato, cucumber, red onion, watermelon and olive oil in a food processor until course. Add the vinegar, salt/pep and basil and pulse until combined. You want it to have some texture. DONE. Wow! Easiest soup ever. So fresh, healthy and easy. It can be stored right in your blender in the fridge until you’re ready to eat. 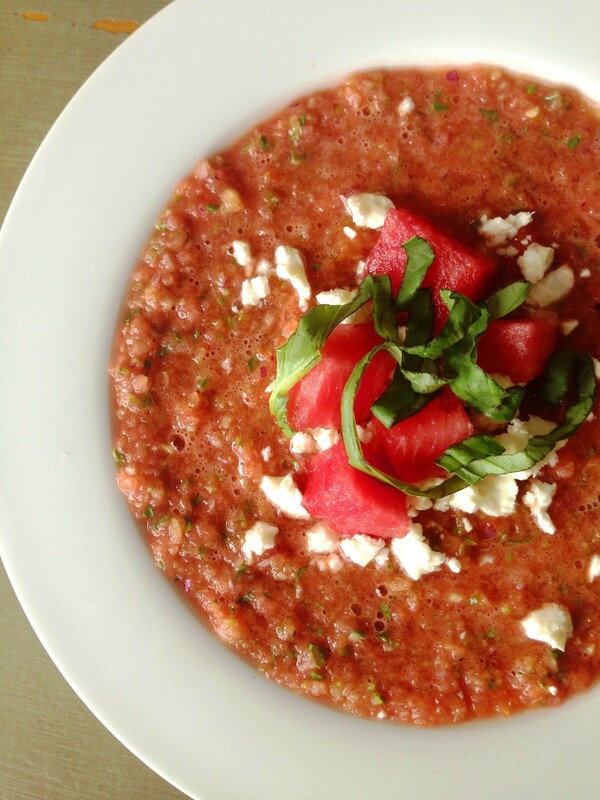 When serving: top with crumbled feta, basil and watermelon. relieved to see there’s feta. I’m not sure if I would like this or not, but I kind of want to try it. My neighbor, on the other hand, would LOVE this! me. Anyhow, I’m definitely pleased I came across it and I’ll be book-marking it and checking back frequently!